Whether you are a scientist or a poet, pro–nuclear energy or staunch opponent, conspiracy theorist or pragmatist, James Mahaffey’s books have served to open up the world of nuclear science like never before. 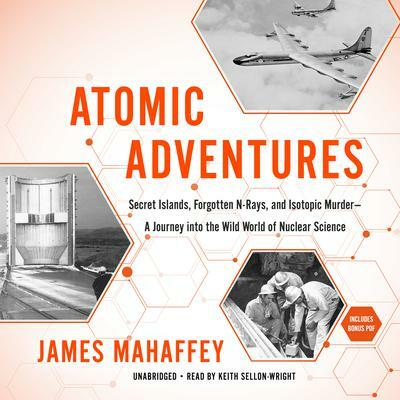 With clear explanations of some of the most complex scientific endeavors in history, Mahaffey’s new book looks back at the atom’s wild, secretive past and then toward its potentially bright future. Mahaffey unearths lost reactors on far flung Pacific islands and trees that were exposed to active fission that changed gender or bloomed in the dead of winter. He explains why we have nuclear submarines but not nuclear aircraft and why cold fusion doesn’t exist. And who knew that radiation counting was once a fashionable trend? Though parts of the nuclear history might seem like a fiction mash-up where cowboys somehow got a hold of a reactor, Mahaffey’s vivid prose holds the reader in thrall of the infectious energy of scientific curiosity and ingenuity that may one day hold the key to solving our energy crisis or sending us to Mars. Whether you are a scientist or a poet, pro–nuclear energy or staunch opponent, conspiracy theorist or pragmatist, James Mahaffey’s books have served to open up the world of nuclear science like never before. With clear explanations of some of the most complex scientific endeavors in history, Mahaffey’s new book looks back at the atom’s wild, secretive past and then toward its potentially bright future. Mahaffey unearths lost reactors on far flung Pacific islands and trees that were exposed to active fission that changed gender or bloomed in the dead of winter. He explains why we have nuclear submarines but not nuclear aircraft and why cold fusion doesn’t exist. And who knew that radiation counting was once a fashionable trend? Though parts of the nuclear history might seem like a fiction mash-up where cowboys somehow got a hold of a reactor, Mahaffey’s vivid prose holds the reader in thrall of the infectious energy of scientific curiosity and ingenuity that may one day hold the key to solving our energy crisis or sending us to Mars.